A number of academics have tried to estimate the economic benefits of the 2000’s boom in unconventional oil and gas productions. 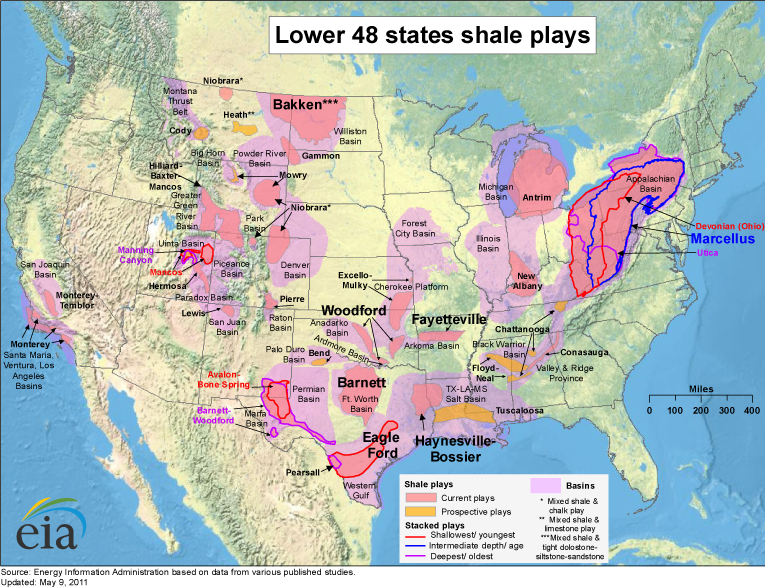 These studies typically use statistical techniques to compare boom areas (such as the Bakken, Barnett, Marcellus, and Eagle Ford) to areas that are generally similar but do not have large shale resources. If all the regions were similar before the boom, but the shale plays had higher job growth during the boom, we would ascribe the difference to the shale boom. Figure 1 shows a map of shale boom counties according to one academic study which used Drillinginfo data (Maniloff & Mastromonaco 2017). Darker counties had more wells drilled into shale formations, while white counties had none. Figure 1: Counties with shale wells(obtained from EIA shapefile overlay) at https://www.eia.gov/analysis/studies/usshalegas/images/shalemap-lg.png. Darker shading means more wells. Well data from Drillinginfo. The major finding is that the shale boom lead to large increases in employment and wages. Feyrer et al (2017) found that the fracking boom created approximately 725,000 jobs. This reduced unemployment at the height of the Great Recession by 0.5 percentage points. A number of other studies find similar results, including Weber (2014), Brown (2014), and Maniloff and Mastromonaco (2017). The increase in jobs leads to an increase in wages, with wages in fracking counties going up by 2.4-13.5 percent. Figure 2, from Maniloff and Mastromonaco (2017), shows the effect in percentages. The crossed line shows how much employment in fracking counties has grown since 1995, relative to non-fracking counties. A value of 0.05 means that employment in fracking counties has grown by 5% more than in non-fracking counties. We see that the difference is relatively stable until the mid-2000’s. After 2007, we see a large increase in employment, with fracking counties having about 5% higher growth by 2011. Importantly, the benefits of the boom seem to be shared broadly across the income distribution. Jacobsen (2016) finds that in addition to mean incomes increasing, the boom lead to substantial increases in wages for workers at the first income decile, first income quartile, median, third income quartile, and ninth income decile. Wages increased across the distribution, with the largest percentage increases for workers at or below the median income. There is also evidence that the fracking boom led to a boom in manufacturing. Hausman and Kellogg (2015) show that natural-gas intensive manufacturing sectors fared better during the Great Recession than non-gas-intensive manufacturing, and that this effect was larger for more gas-intensive sectors. Fertilizer manufacturing, the most gas-intensive sector in the economy, saw an employment increase of 8.6% and wage increase of 24.8 % during a time when non-gas-intensive manufacturing reduced employment by 16.5% and wages by 3.7%. Overall, employment in gas-intensive industries was 3.4-9.1% higher due to the fracking boom. Overall, there is strong evidence that the fracking boom caused a substantial increase in employment and wages in areas with shale plays, and evidence that the benefits were widespread. It’s tough to use statistical methods relying on years of data to analyze current market conditions, but they can certainly shed light on the recent past! Brown, Jason P. “Production of natural gas from shale in local economies: a resource blessing or curse?.” Economic Review-Federal Reserve Bank of Kansas City (2014): 5. Feyrer, James, Erin T. Mansur, and Bruce Sacerdote. “Geographic dispersion of economic shocks: Evidence from the fracking revolution.” The American Economic Review 107.4 (2017): 1313-1334. Hausman, Catherine, and Kellogg, Ryan. “Welfare and Distributional Implications of Shale Gas.” Brookings Papers on Economic Activity (2015). Jacobsen, Grant D. Who Wins in an Energy Boom? Evidence from Wage Rates and Housing. Working Paper, University of Oregon, 2016. Maniloff, Peter, and Ralph Mastromonaco. “The Local Employment Impacts of Fracking: A National Study.” Resource and Energy Economics (2017). Weber, Jeremy G. “A decade of natural gas development: The makings of a resource curse?.” Resource and Energy Economics 37 (2014): 168-183.